When your Porsche needs maintenance or repairs, it’s important to choose the right repair shop for service. You may be considering whether you should take your car to a Porsche dealership or instead opt for an independent Porsche repair center. If your only experience is with the dealership, you may not know what to look for in an independent Porsche auto repair shop. To help you out, here are five great reasons you should choose an independent Porsche repair shop over the dealership. When you need work done on your Porsche, compare cost estimates between an independent repair shop and the dealership. You may find the dealership is much more expensive. You may save on labor and parts by getting your repairs done at an independent service repair center. Did you know that you don’t have to go to a dealership to maintain the warranty for all of your car’s maintenance and repairs? There should be no issue using an independent repair shop for scheduled maintenance and repair while your vehicle is within the warranty period. Most warranties can be used at an independent repair shop. Contact your independent shop if you have any questions regarding whether your warranty work will be covered. Dealerships are only allowed to use the original manufacturer’s parts. Independent shops can give you a choice in using these name brand parts or parts that are less costly but equal in quality. Independent repair shop technicians tend to have a greater number of years’ experience, since many previously started out at dealerships then honed their craft and branched out to independent shops. These Porsche certified trained technicians will typically be the same ones working on your vehicle each time you bring it in for maintenance. Independent shops tend to be more service-oriented, friendly and concerned about providing you with the best possible customer experience. 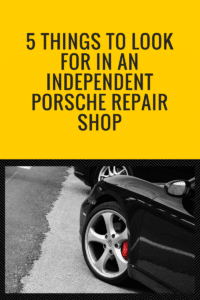 You may have to travel a considerable distance to visit a Porsche dealership, but you can generally find an independent Porsche repair shop much closer to home. You can talk to real people on the phone. You can get to know your customer service rep.
You are more likely to have the same technician each time. Your technician gets to know you and your vehicle. All of these benefits make for better communication, which means better service all around. If you need repair work or want to schedule maintenance on your Porsche in the San Jose and Santa Clara area, contact us. At Master Automotive, we pride ourselves in customer satisfaction.